In the previous post, we began to examine the claim, made recently by Jan Terje Faarlund and Joseph Emonds, that Modern English is a Scandinavian language rather than a descendant of Old English, a West Germanic tongue that was spoken in England between the 5th and 11th centuries. At the end of that post, we concluded that preposition stranding (that is putting a preposition at the end of the sentence, as in Who did you talk to?) is not a Scandinavian contribution to English, but a natural development of a structure that was already present in Old English. Significantly, this example of VO order in Old English contains the verb niman ‘to take’, which in due course was driven out of the lexicon by a Norse loan taka of the same meaning (the old root niman was preserved in nimble originally meaning ‘quick to grasp’ and numb originally meaning ‘taken, seized’). In fact, Old Norse, much like Old/Middle English, was transitioning from the OV order, which was found in the Proto-Germanic, to the VO order, which characterizes all Modern Scandinavian languages. While it is difficult to estimate the relative frequency of different constructions in an earlier form of a language, it appears that in the relevant period the language of the Scandinavian settlers in Britain was more predominantly OV rather than VO (this issue is discussed in great detail in Jens Haugan’s doctoral dissertation Old Norse Word Order and Information structure). Gestern hat Martin das Buch gelesen. I går har Martin lest den boken. Obviously, the change from V2 in Old English to no-V2 in Modern English cannot be explained by copying a Scandinavian pattern. 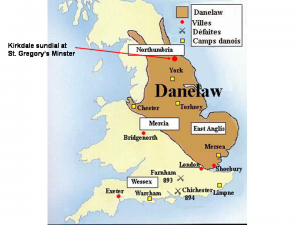 On the contrary, the V2 pattern persisted longer, well into the 13th century, in the northern areas where Scandinavian influences were most pronounced, according to Fischer and van der Wurff’s chapter on syntax in A History of the English Language (2006, edited by Richard Hogg and David Denison, p. 184). 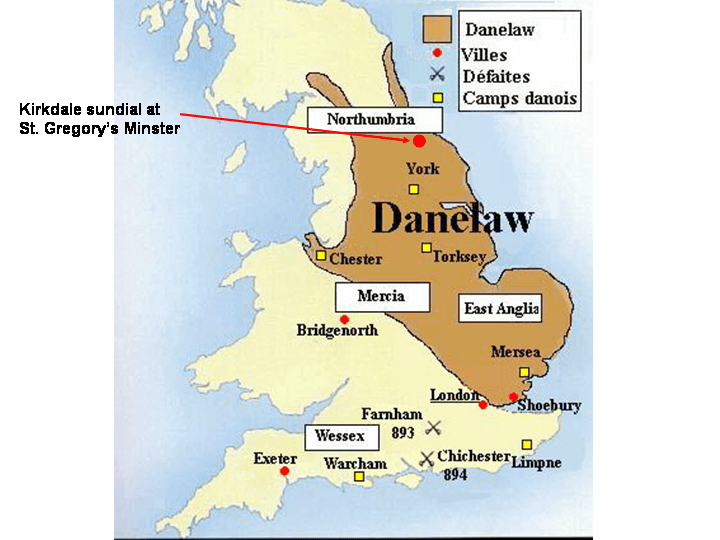 Thus, they find explanation for the loss of V2 in English not in contact with the Scandinavian-speaking Vikings but in complex structural properties found in Old English itself. Yet the Vikings in the north (and later also the Normans in the south) had a role to play in the gradual disappearance of the V2: they simply got rid of patterns that were too complicated for adult second-language learners of English to handle. In particular, Old English had different rules for placement of subjects depending on whether they were nouns or pronouns: if a subject was a pronoun, it was placed before the verb, and the V2 rule was not applicable. Old Norse, however, bestowed no special status on pronominal subjects, so Norse-speaking Vikings, who had no use for extra grammatical complexity in a language that was not their native one, gravitated towards the “one rule fits all” system, extending the preverbal placement of subjects from pronouns to nouns. A similar reasoning can be applied to explaining other grammatical changes, such as the decline of the case system and the verbal conjugation, during the transition from Old to Middle English: Norse-speaking Vikings and later French-speaking Normans eliminated those aspects of the Anglo-Saxon inflection that they found too difficult. For example, the system of case markers—typically, indistinctly pronounced endings on nouns and adjectives—was too tricky for non-native adult learners to pick up. As a result, they simplified the system, first by using certain endings in the wrong places and then by dropping the case endings altogether. Consider, for instance, the inscription on the Kirkdale sundial, embedded in the wall of Saint Gregory’s church in North Yorkshire. 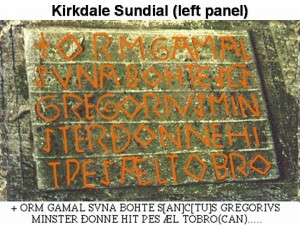 The inscription is written in a late form of Old English, as it dates from 1055-1065, judging by its reference to “the days of King Edward and Earl Tostig” (in the bottom two lines on the right panel): King Edward is Edward the Confessor, who reigned in 1042–1066, and Earl Tostig is Tostig Godwinson, the son of Earl Godwin of Wessex and the brother of Harold Godwinson (who opposed William the Conqueror in the Battle of Hastings); Tostig held the Earldom of Northumbria in 1055-1065. 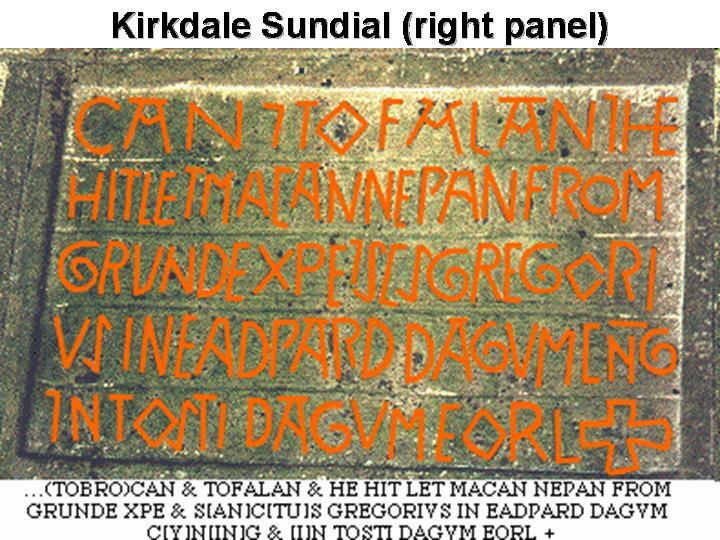 That Scandinavian speakers had something to do with this inscription is obvious not only from its location in the heart of Danelaw (note that kirk- in the toponym is a Norse word for ‘church’), but also from the text itself. 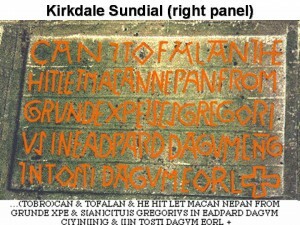 The two personal names that appear in the bottom line of the central panel, “Hawarth” and “Brand”, as well as the two names in the first line on the left panel, “Orm” and “Gamal”, are Scandinavian in origin, reminding us that language contact often results in expansion of the repertoire of names as well as of the lexicon. Also of Scandinavian origin is the use of the patronymic formula Gamal svna, common in Scandinavia and rare in Old English outside of Scandinavian-influenced regions. This formula gave rise to English last names such as Johnson, Stevenson, and Peterson (the equivalent English patronymics end in -ing, as in Browning). The use of the word eorl ‘earl’ as a title is another sign of Nordic influence: in Old English the word tended to be used in poetry with a general meaning of ‘man, warrior, hero’, while the rank of ‘earl’ was expressed by another Old English word, ealdormann (which survives in Modern English as alderman). 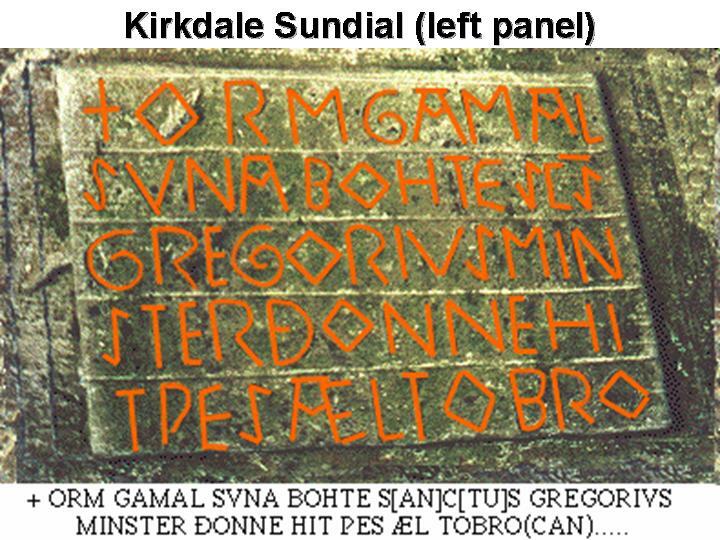 The word solmerca for ‘sundial’ is half Old Norse and half Old English: the first element of the compound, sol- ‘sun’, is Norse, whereas the second element is likely native to English. Finally, the word tide ‘time’ is likewise of Scandinavian origin; in Modern English it is preserved in its earlier meaning of ‘point in time’ only in expressions such as Yuletide. 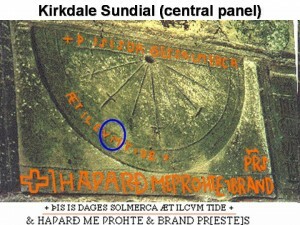 The Kirkdale sundial inscription also illustrates the development of the English genitive. Like other cases, in earlier forms of Old English genitive was marked by special endings, but in the later period exemplified by this inscription, the genitive endings disappear. Hence, we see Eadward dagum cyning (the latter is abbreviated as CNG) and Tosti(g) dagum eorl, instead of the expected earlier forms Eadwardes dagum cyninges and Tostiges dagum eorles, respectively. ** Which noun denotes a possessor and which one the possessed has to be understood purely from the word order and the context (the postposition of the titles ‘king’ and ‘earl’ is typical of medieval writing). So where does the modern possessive marking ‘s come from? 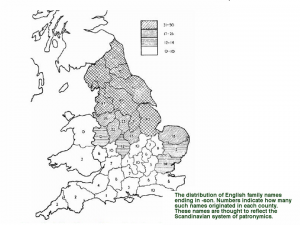 Instead of being a Scandinavian import, as Faarlund and Emonds claim, it is a remnant of the genitive case ending that survived in southern parts of England less affected by Old Norse. It is a reduced form of the earlier ending -es originally used for certain masculine and neuter nouns, but later extended to feminine nouns as well (the genitive ending for plural nouns was -as, which too lost its vowel over time). Nor is the phrasal genitive, that is the attachment of ‘s to the phrase rather than the head, a Scandinavian structure. First, the appearance of phrasal genitive in English dates to a much later period, centuries after the Viking Age. Even in texts like the ballad “Sir Patrick Spens”, which relates historical events of the late 13th century, we still find the ‘s attached to the head rather than the whole phrase, as in the King’s dochter of Noroway for ‘the King of Norway’s daughter’. Second, Old Norse did not have phrasal genitive, so it could not have contributed it to what became Modern English (e.g. Icelandic does not have phrasal genitive to this day). The phrasal genitive developed independently in English and in Norwegian and made its appearance in both languages relatively late. At least in English, the phrasal genitive is attributable to the so-called “his genitive”, a construction particularly popular in the late sixteenth and early seventeenth century and employed in the titles of John Lyly’s Euphues His England (1580), Ben Jonson’s Sejanus His Fall (1603), and John Donne’s Ignatius His Conclave (1611). Over time, the possessive pronoun his wore down to a mere ‘s, making it indistinguishable from the remnants of the genitive case ending, and its use was extended to feminine nouns. The very same development happened in another West Germanic language, Afrikaans, where the possessive pronoun sy ‘his’ developed into an all-around possessive element se, which can appear with both masculine and feminine possessors, as in die man se kinders ‘the man’s children’ and die vrouens se kinders ‘the women’s children’. As can be seen from the above discussion, Faarlund’s claim that these types of grammatical structures “are very unlikely to change within a language” is incorrect. In the next post, we will consider the more general question of whether grammatical patterns such as these can be borrowed from one language into another. *In most Germanic languages—with the notable exception of Icelandic and Yiddish—the V2 phenomenon happens only in main clauses. For clarity’s sake, we will ignore what happens in subordinate clauses. ** The form eorles is attested, for example, in an inscription on an early eleventh century grave-marker from the Old Minster, Winchester, discussed in The Oxford History of English, p. 76. Rögnvaldsson, Eiríkur (1996) ‘Word Order Variation in the VP in Old Icelandic’. In: Working Papers in Scandinavian Syntax 58, pp. 55-86.